Are you satisfied with just “shopping and dining out” during your stay in Japan? If you love Japanese food, why don’t you learn how to cook Japanese home style cooking? If you agree, join us at Tsukiji Cooking! 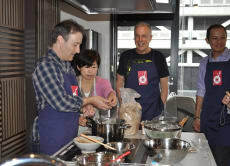 At Tsukiji Cooking,we strive to carry out hands-on and fun-filled activities; cooking classes for Washoku (Japanese cuisine) or Japanese home-style dishes, to act as a bridge for deepening mutual understandings through Japanese food cultures with people from all over the world. Let’s explore the world of Washoku(Japanese traditional cuisine) and discover its flavors and the things that make your stay in Japan so special with us! Through Tsukiji Cooking hands-on classes, we sincerely hope that you'll be able to share many happy moments with your family and loved ones.